Earlier this month, Real Madrid’s Cristiano Ronaldo was once again named the top footballer in the world when he won the 2017 Ballon d’Or. It was the fifth time in Ronaldo’s career that he has won the award, equaling the number won by his chief rival, Lionel Messi of F.C. Barcelona. Messi finished second in the voting, having already won the award five times in his career. 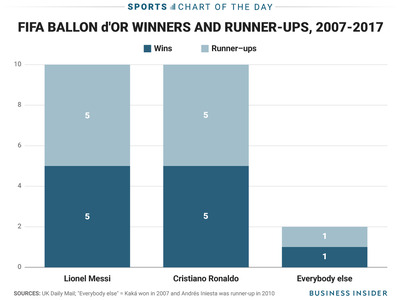 In fact, Ronaldo and Messi have been so dominant in the world of soccer that they have combined to win the last ten Ballon d’Or awards and have finished second another ten times in the last 11 years. Over the last 11 years, they have combined to finish first or second in the voting 20 times. Everybody else has done it two times.